A Battlefield Run, Embarrassing Costumes, and Forced Consumption of Alcohol: College Discloses Hazing Violations From Past Five Years | The Gettysburgian. To comply with Pennsylvania’s Act 80 of 2018, the college released two reports detailing hazing incidents from the past five years. The reports detail 10 incidents, of which nine resulted in a finding of responsibility through the college’s judicial processes. All 10 incidents pertain to Greek organizations; in all, seven different organizations (four fraternities, three sororities) have been found responsible for hazing since 2013. The college plans to revisit its institutional definition of hazing to tack more closely to state law. Seven Greek organizations and one individual student have been found responsible through the college’s judicial processes for hazing over the past five years, a total that includes five incidents that were classified as violations of federal or state law. The findings came to light when the college released two reports to comply with Pennsylvania’s Act 80 of 2018, which came on the heels of a hazing incident at Penn State in which Timothy Piazza, a pledge of the Beta Theta Pi fraternity, died. Act 80 mandates that all Pennsylvania colleges report to the public all violations of institutional hazing policy or the law. The college divided its disclosure into two reports: one detailing incidents that were classified as violations of college policy, the other detailing incidents that were classified as violating state or federal law. In all, four fraternities (Lambda Chi Alpha, Phi Gamma Delta, Phi Delta Theta, and Alpha Tau Omega) and three sororities (Sigma Sigma Sigma, Gamma Phi Beta, and Chi Omega) have been found responsible for hazing violations since 2013. 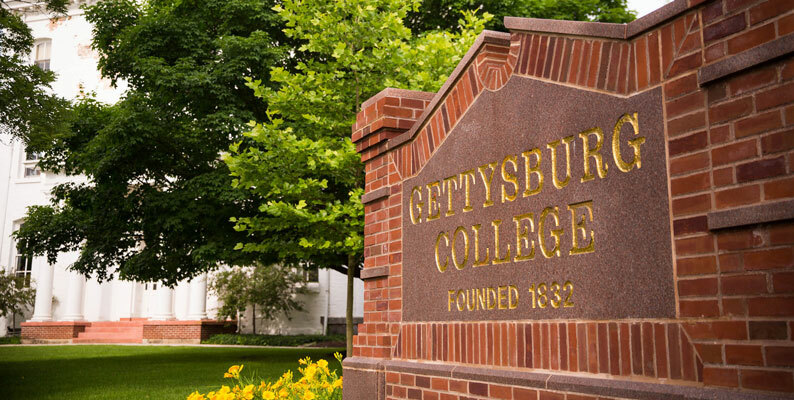 Gettysburg College currently recognizes nine fraternities and seven sororities. In total, the reports outline 10 incidents, of which nine resulted in a finding of responsibility: eight against a Greek organization and one against an individual who was a member of a Greek organization. The time frame covered in the reports dates from the fall 2013 semester through fall 2018. Moving forward, the college will be required to disclose reported incidents on January 1 and August 1 of each year to comply with Act 80. Dean of Students Julie Ramsey did not directly address a question regarding whether the reports indicate a systemic problem within the Greek community at Gettysburg, but she did call hazing a national problem. Director of Student Activities and Greek Life Jonathan Allen added that the college has redoubled its educational and enforcement efforts over the past five years, which, he said, has led to a decrease in the number of organizations found responsible for hazing. 11 Greek organizations were found responsible for hazing from 2011 to 2014, while four have been found responsible since 2015. The most recent incident from the college’s first release occurred in November 2018. In that incident, Lambda Chi Alpha was found responsible for subjecting its new members to wear embarrassing costumes, sleep in the chapter’s house, and participate in a run around the battlefield. The college found the chapter responsible for “low level hazing and violating the Recruitment & New Member Education Policy” and imposed nine weeks of social probation, a suspension of recruiting, and required educational programming. Asked what constitutes a “low level” hazing offense, Ramsey said she expects the college will revisit its institutional definition to tack more closely to state law, which will result in eliminating the distinction between low level and high level hazing. He added that the battlefield run was open to the entire chapter and was also optional. Moving forward, though, Gangi said that the chapter will make changes. “We understand that our previous practices were not agreeable with the school’s policies and we have made changes that will continue to uphold our traditions and ideals but challenge old practices and satisfy the school’s policy and our national headquarter’s [sic] policy,” he said. Kurtis Grey ’21, one of the organization’s new members this fall who has since become its vice president for external affairs, said that, although he recognizes the fraternity’s conduct “may have fallen short of school standards in some aspects,” which he and his brothers own, no hazing was forced upon new members. Grey asserted that there was no malicious intent in any of the hazing that transpired. “I think it is important to note that both our house and people outside of it have stated their belief that these transgressions were done only with the best of intentions to build a complete bond, rather than harm anyone in any way,” he added. Phi Delta Theta, which, in November 2016, was found responsible for compelling new members to sleep in the chapter house, consume food products and a concoction of milk and vinegar, and complete calisthenics. The organization received seven penalties including indefinite loss of social host privileges, walkthroughs by the Department of Public Safety, and development of a 3-5 year improvement plan. Notably, that plan was not referenced at all in the chapter’s 2017 or 2016 evaluation by the Office of Student Activities & Greek Life (OSAGL). Phi Gamma Delta, which, in August 2015, was found responsible for hazing that occurred in 2013 in which new members were subjected to line ups, wall sits, and assigned costumes. The college imposed conduct probation for two years, a loss of social host privileges for six weeks, and creation of a behavioral agreement. Sigma Sigma Sigma, which, in September 2013, was found responsible for compelling a new member to drink alcohol on bid night. The organization received a written warning. Ramsey said that she is not aware of any cases being referred to law enforcement. “It essentially puts an organization on official notice that further violations will result in more severe sanctions and it is often paired with educational sanctions,” Allen said. Educational sanctions vary based upon the context of the policy violation, he added, but are aimed at correcting the underlying behavior. Leaders of Greek organizations found responsible for past violations emphasized their chapters’ current practices that forbid hazing. Becky Montross ’20, President of Sigma Sigma Sigma, emphasized that the organization has strict policies in place that forbid hazing. She added that she is grateful for Pennsylvania’s new anti-hazing law, but was disheartened to learn of the incident that occurred in her organization more than five years ago. In addition to the incidents classified as violations of state or federal law, the college detailed five incidents in which violations of the college’s anti-hazing policy were alleged. In four of the five cases, the organization or individual was found responsible for a policy violation. Most recently, in March 2018, a member of Alpha Chi Rho unsuccessfully sought to compel a new member to write an Anti-Semitic essay. The individual, who was not named in the college’s report, was found responsible for violating the college’s hazing policy, but the organization was not charged. The individual was required to help develop a hazing prevention program and to write an apology letter to Alpha Chi Rho. The other incidents involved charges of organizational responsibility. Phi Gamma Delta, which, in December 2015, was found responsible for enforcing dress regulations of new members, directing them to clean the fraternity house, and be at the fraternity house early each morning to raise the fraternity flag. After the incident, the college required that the length of the new member education period be shortened and that the chapter communicate with parents during recruitment. Chi Omega, which, in September 2013, was found responsible for requiring its new members to run around campus on Bid Night. The college issued a written warning. Representatives of Gamma Phi Beta, Phi Delta Theta, and Alpha Tau Omega did not respond to a request for comment. “We believe it’s important to appropriately address and stop hazing in any and all cases,” she said. Allen reiterated that the college is committed to improving its strategy towards hazing with the ultimate goal of ending it completely.